Nourishing and exercising our dogs' minds is just as important as nourishing and exercising their bodies. Tiring them out mentally is equally as wonderful for them as tiring them out physically. Just doing one without the other isn't likely to keep them as happy and well-rounded as they deserve. So how can we exercise their minds? And when should we do it? The "when" is an easy one... whenever you can! On a rainy day when your pup isn't in the mood for a walk (just gets their business done and zooms back inside), that's a perfect opportunity to work on some brain games. Or instead of watching a half-hour sitcom, practice some mental exercises instead (and then you can both relax on the couch for the rest of the Netflix marathon together). Or if you work from home or are doing some other tasks around the house, you might be able to multitask and keep your dog busy and out from underfoot while you work! 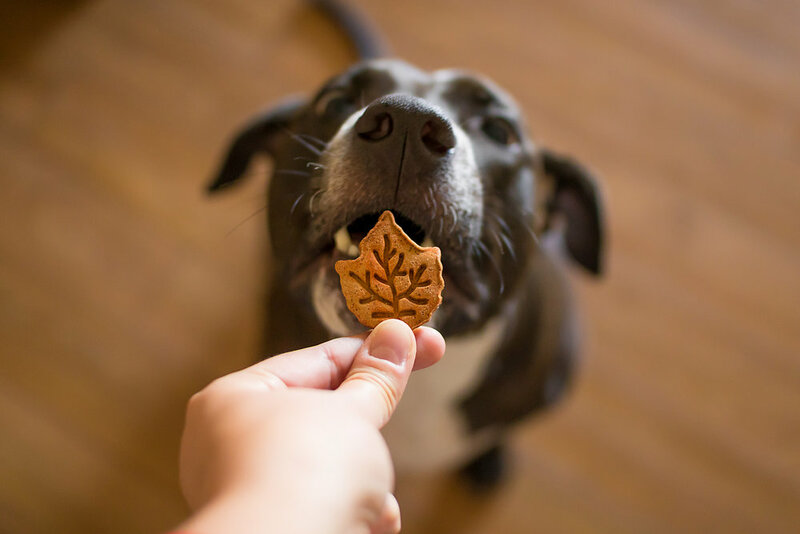 Check out 2 Paws Up dog treats by Madison here. Now for the fun stuff... how to do it! There are so many different ways you can help keep your dog's mind working and learning. And they can vary in terms of how active you need to be during the game (some of them will allow you to multitask if necessary). First off, Ruby's favourite thing is to work for treats - specifically hotdog pieces! She has learned so many tricks and commands because of how badly she wants that hotdog. That's how I taught her to be such a patient model when I photograph her, how to run to me and get in the "heel" position, to back away from me, play dead, spin, sit pretty, weave through my legs, etc. 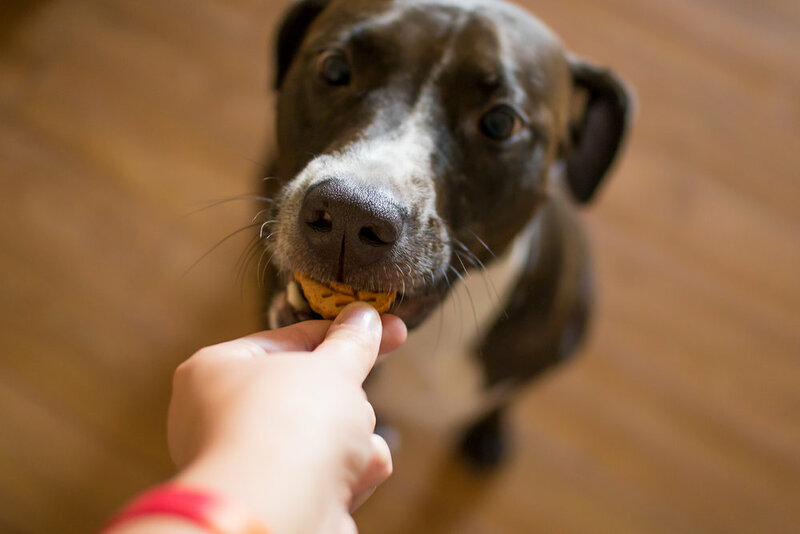 So getting some yummy treats (or you can use toys as a reward if that's more motivational for your pup) and working on tricks is a great way to get them thinking and learning. As always, start small/basic with the tricks and build on them once you've repeated them enough to get reliable results. If your pup is getting confused or frustrated and isn't understanding, try disecting the trick a little and see if you can teach a simpler version of it first. It's no fun for your pup if they can't understand what you want and they can't earn that treat. Set them up for success by ensuring that they can understand what you want. The moment they do the correct behaviour, you're going to "mark" it. This can be done verbally with a "yes!" or a "good!" or you can use a clicker instead. And then treat them! If you and your dog really love working on tricks together, you can even work up to earning your Trick Dog Certifications (you can check that out here). Another game Ruby loves to play is Find It, which is basically Hide'n'Seek but with treats. Your pup will need to know the Stay command for this one while you hide the treat. Or I suppose if the room has a door you could close it and leave them outside the room until you're ready to let them in. Our version goes like this: I bring Ruby to the mat by our front door and ask her to sit and wait. I go into the living room (which is out of her eyesight) and hide one piece of hotdog somewhere. Then I shout "Find it!" and she comes charging in and has to search for the treat. As soon as she's found it, I say "good!" and then bring her back to the mat to wait while I hide another. This game helps her practice her nosework and learn to find things by scent and not just look for the treat with her eyes. You could build on this after a while by requiring her to come back to you and sit after she finds the treat, or maybe even go all the way back to the mat! The more you rehearse what you want them to do, the more they'll catch on and probably try to do it on their own before you ask. Ruby also has a wooden toy that she enjoys, but she's too smart for it already. It's a flat rectangle with 8 sliding covers that conceal hollow compartments beneath. So I can hide treats in some of those compartments and then she has to use her nose or paws to slide the compartments open and find the treats inside. The compartments do have a peg that sticks up to move the cover easier. But when you first introduce this game, the dog doesn't even know that there are compartments, or how to access them, or which direction the covers might move. It looks easy to humans, but it's fun to watch them try out different strategies until they discover the secret! You can make your own variations of that type of game - you can put treats inside an empty 2L bottle and have your pup roll it around the house until they figure out how to get the treats out. I've seen some people take 3 or 4 of those bottles and cut a hole on either side so that they can slide a wooden dowel through all of them (almost like you stabbed all 4 with one sword!)... then they attach that piece of wood to something more sturdy that holds it in place. Now the bottles can swivel on that dowel and the dog needs to get them upside down in order for the treats to fall out! You can see a picture here. 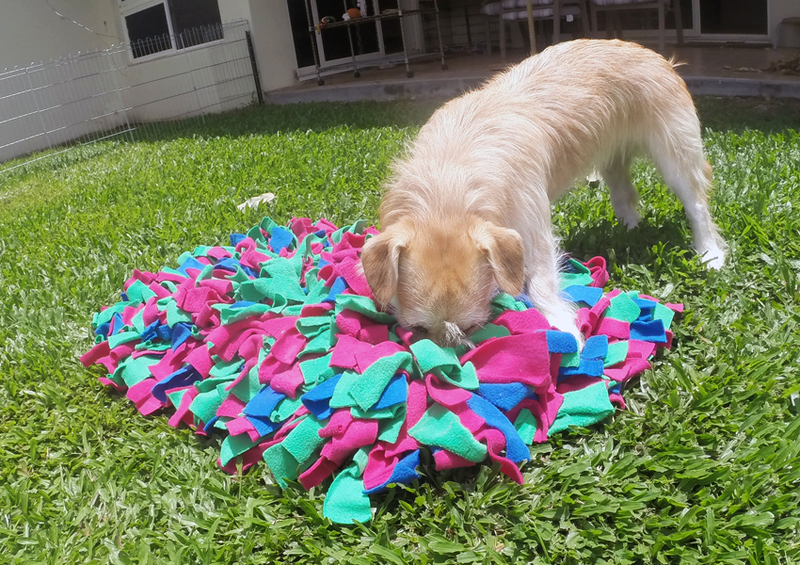 There's also a "snuffle mat" that I've seen people make, where it's a little rug with ruffles all over it, and you can drop treats into it so they're hidden and they have to be sniffed out and retrieved! I would recommend joining the Facebook group "Brain Games for Dogs" for more great ideas from other pup parents! What games does your dog love to play? And what treats or toys get them most excited to work with you? These kinds of games are a great way to bond with your dog while also exercising that awesome brain of theirs! What is A Reveal Like?